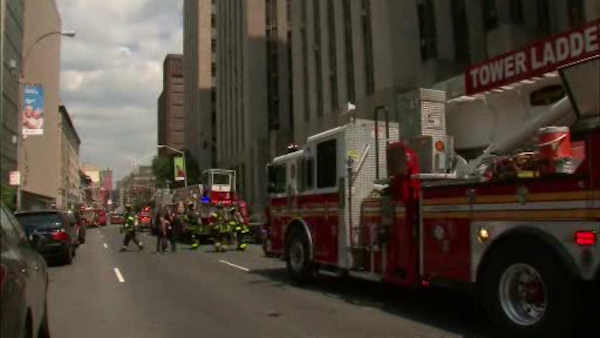 LOWER MANHATTAN (WABC) -- A transformer malfunction is being blamed for igniting a fire that caused a heavy smoke condition Friday at a criminal court building in Lower Manhattan. A small fire broke out just after noon in the basement electrical system of 100 Centre Street. Firefighters brought the flames under control quickly. However, the building's holding cells were cleared out as smoke filled the lower floors. Inmates from those trials were taken outside in custody and then to the third floor. The building was moved over to power from backup generators and the courts resumed proceedings. Fans were set up to ventilate the building, which initially registered carbon monoxide readings of about 100 parts per million. The building was temporarily closed to the public until it was fully ventilated.